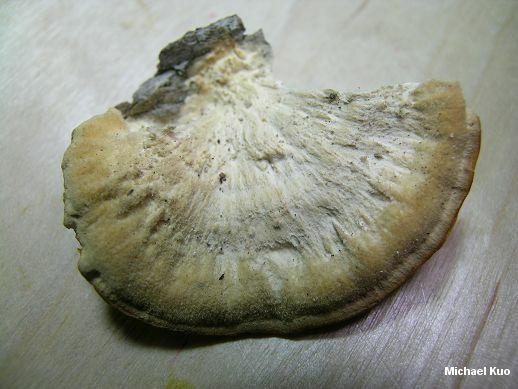 Trametes pubescens is a small, thin polypore with a cream-colored, finely velvety cap surface that lacks strongly contrasting zones of color (most other turkey tail-like species of Trametes are decidedly zoned). Its pore surface becomes yellowish with age, and features 3-5 angular pores per mm. 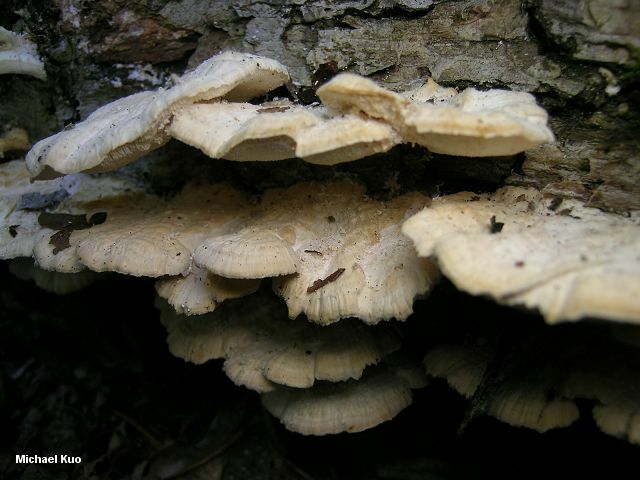 Trametes pubescens is a decomposer of the deadwood of hardwoods, widely distributed on our continent. Ecology: Saprobic on the deadwood of hardwoods (rarely reported on conifer wood); annual; causing a white rot; growing in clusters on logs and stumps; summer and fall; widely distributed across North America. 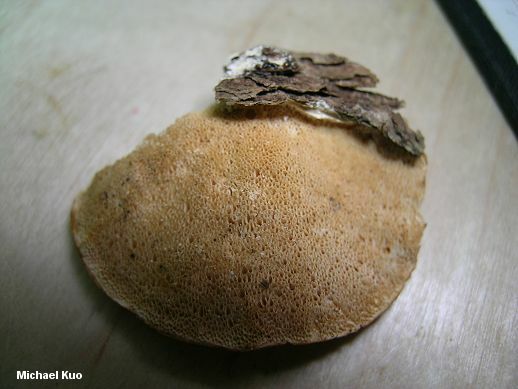 Cap: Up to 8 cm across and 5 cm deep; semicircular, irregularly bracket-shaped, or kidney-shaped; sometimes fusing laterally with other caps; velvety to finely velvety, sometimes becoming nearly bald with age; often finely, radially lined and furrowed, especially on the margin; cream colored; sometimes with faint textural zones but without contrasting zones of color. Pore Surface: Creamy, becoming yellowish with age; with 3-5 angular pores per mm; tubes to 6 mm deep. Flesh: Insubstantial; whitish; tough and corky. Chemical Reactions: KOH on flesh yellow. 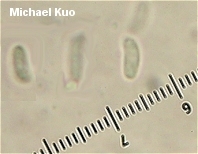 Microscopic Features: Spores 5-7 x 1.5-2 µ; smooth; cylindric; inamyloid. Cystidia absent. Hyphal system trimitic. REFERENCES: (Schumacher, 1803) Pilát, 1939. (Fries, 1821; Saccardo, 1888; Overholts, 1953; Gilbertson & Ryvarden, 1987; Phillips, 1991/2005; Barron, 1999; McNeil, 2006; Binion et al., 2008.) Herb. Kuo 09220402.